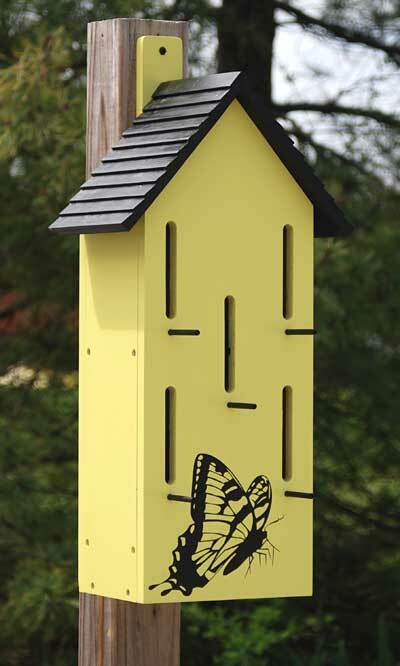 Start a beautiful butterfly garden in your backyard using the BestNest Yellow Classic Butterfly House with Perches. Offering these lovely and elusive insects a shelter allows them to rest during their migration, or helps them stay protected in rainstorms. This tall, bold yellow unit has five separate oval slots on its face, each with a black wooden perch underneath. These openings mimic crevices found in wood piles or bark, which butterflies naturally use for protection and shelter. A detailed butterfly image occupies the base of the home, and the black, lapped roof completes the stylish piece. A hanging tab on the back of the roost swings upward, for you to mount the item onto a post or tree in moments with the included screw. The bright yellow color enhances nearby foliage, and the wooden construction furthers the natural theme. Provide butterflies a fantastic shelter in your garden with this Yellow Classic Butterfly House with Perches. Note: Climate and the elements will weather the house and change its appearance over time; however, weathering will add to the home's natural charm without compromising its function. Should you want to preserve the finish (paint), you should select a polyurethane product that is recommended for marine use (UV Rated). You should expect that once left outside, the product will weather and require refinishing.